You wish to watch a movie on your computer or Home theatre, what do you do? Since cost is primary concern for most of middleclass people, many of us will be tempted to go for option 2 or 3 which directly or indirectly promotes piracy, when multiple illegal copies of a movie are made. Are you aware (if you've seen thier ads on TV), original VCDs and DVDs can be purchased at the cost of pirated one? 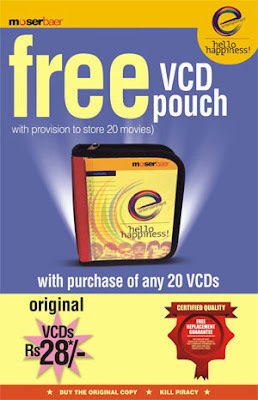 Moserbaer India (BSE:MOSR, a leading digital media manufacturer) has taken an initiative in this regard wherein they sell Full movie VCDs Rs 28 onwards and DVDs Rs 34 onwards. Hindi and regional language film VCDs are priced at Rs 28, English movie VCDs are priced at Rs 49, DVDs priced at Rs 34 onwards (Regional Languages-Rs 34, English: Rs 69). The price is so aggressive that it is at par with option 2 and 3 listed above. For the price of a pirated one you get original one. Even if you thought of taking a VCD on rent and making a copy using your DVD writer, it still makes more sense to buy original one. All leading music stores, departmental stores like Big Bazaar, even some stationary shops sell these cheap VCDs and DVDs. For entire catalog of available titles, to buy online or for exact address of outlets checkout Moserbaer Home entertainment website. Is it profitable for Moserbear to do this? Yes. MoserBaer has its own manufacturing unit for digital media (CDRs and DVDRs etc) so the cost of CD/DVD for them is negligible (Blank CDRs retail at around Rs 6 onwards while DVDRs retail at Rs 15 onwards. Manufacturing cost should be around 20% of that amount). The movies they sell are usually old ones which do not have much demand as such, so it makes profitable sense to sell them with very low margin. 1. There is a money back guarantee but not sure to what extent it is feasible. Few may be of bad quality or may not play properly if faulty. You need to take that risk. 2. Latest movies may not be available like this. Only those which are few years old are sold this way (if the movie is good and if you’ve not watched it yet it is still worth collecting it.) (Note: Some exceptions may be there: for example, "Apne" and "ek chalis ki last local", Hindi movies few months old but weren’t a success at box office, are already available with MB. Newer movies are priced few rupees higher. 3. All movies will have Moser baer watermark on it. 5. 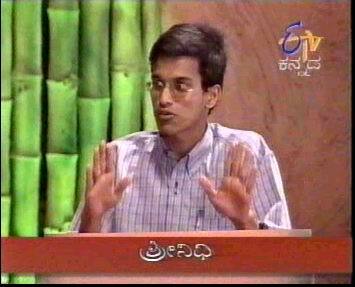 Some movies may be of bad quality or have some scenes missing - Fiza VCD had a delay between audio and video-I hear the dialogs first and see lip moment few seconds later, In a Kannada Movie (Ananda Bhairavi) I faced playback control issues, Aanken VCD had last few mins of video missing. 7.I also learnt that Moserbaer has dedicated over 16 crore for this mission and is acquiring several small and medium recording companies. I hope this brings more and more cost advantage to cunsumers in long run. This is an attempt by MoserBaer to focus on volume of sale and gain profit, which is beneficial for both consumers who want genuine content at reasonable price and for companies who do not want to loose their market to piracy industry. I remember Lahari Recordings in Karnataka were selling original audio cassets for Rs 20 once a time. These moves, if become popular among masses, should help eradicate video piracy and save entertainment industry. A pirated DVD (containing 3-4 latest movies) gets sold for around Rs 40 (negotiable) at Burma Bazaar Chennai (and at similar places in other cities), hence there’s still a competition for Moserbaer. I hope people change their mind and shift towards MB. yeah! Have checked out some CDs in many outlets! They are pretty cheap n good! But the problem is the collection they have! They have to improve their collection getting more movies as possible. Yes thier collection is poor. Hey Shrinidhi, I have also seen these VCDs and DVDs. Unfortunately, most of the collection is crappy. The best movies are either unavailable in shops or cost a ton. With the aggressive marketing Moserbear has been doing i was aware about the VCD’s & DVD’s but you have actually give a very comparison and anaylsis of the whole scene. You have made some good points. I think with MB coming into market the overall CD and DVD market will grow but to curb piracy is very hard because the titles MB have are mostly crap movies, just a few are good. I got Gulzaar’s IZZAZAT at MB and I was so happy to own it. Another and most positive effect of Moser Beer coming into market is that it has forced established players like T Series and Shemaroo to reduce prices. You konow I bought 4 DVD’s of Shyam Benegal’s movies at just around 80/ each originally priced 349/ each. First time in my life I bought Original DVD’s. Amit, Yes, collection is very poor, but few are quite good and we can hope the good titles to be available this way over a period of time. But software companies get their profit from commercial organizations so they can absorb the impact of piracy by domestic users. If they reduce the price, they may suffer loss as corporate customers will may less and this loss may or may not be compensated by additional purchase by individual customers. but the quality i am afraid is poor. I bought a couple of them VCD’s and i am shocked to see even the scenes missing in the movie. A couple of friends of mine who have bought the same movie’s on VCD confirmed it too that there are 3-4 scene missing from the Movies. I think when they compromise on price they go down in quality too. As I already wrote, one should be prepared for certain compromise on quality. I’ve observed that they are using higher capacity discs to ensure that number of discs are confined to 2. Poor Collection? What do u mean by that? Most titles are old. But they do have some 90's movies like Vaastaav, etc. Besides, Sony has now released Kuch Kuch Hota Hai, etc on DVD for less than Rs90. So if you want to catch up on classics that you missed when they were released. This is a great chance. What I meant be poor collection is that price is the only exciting factor and not movie titles. yes, if you want age old classics then Moserbaer Hello Happiness is the best place. Things are changing over time (this post was written several months back) and moserbaer is very serious about this business and we can expect a better collection over a period of time. I found some interesting collection in kannada movies. first 2 movies are very good. 3rd one is also good. I have bought more, but i could remember only these 3 right now. but its a great work form mosserbear as well as from you to make people know about this. and many more. The collection is very huge, though all are age old collections... Refer their site for full list. Thanks for all the info.i stay in b'bay very few places whr i could get kannada movies.After reading yr comments i bought 7 kannada movies.I hope they improve the collection. Firstly it is exciting to see that people are quite enthusiastic about our Service. This is exactly the kind of response which motivates us to perform better for our Customer’s sake. 1)We are releasing a number of new/hit/good movies in the next few months. Also we are updating our Collection at a rapid pace. So be prepared to be “knocked out” during your next visit. 2)We pride on our Print Quality. I believe that the picture problem you experienced may be due to the original print being bad. Otherwise there shouldn’t be any quality issues. And thanks for enlightening the customers about the great service. Be the light. Welcome to my blog. Yes, of late some new titles are being released on Moserbaer pretty early-that's a good development. I've already mentioned that. Thanks for offering to help via email. Best wishes to you and your company. Recently, fake instructional dvd’s must really be prevented from spreading in the market. This brings a negative result to media.